When the sweat's dripping down the back of your neck and the sirens and concrete canyons get all too much, New York's parks offer up open skies and flat, green - ahhh, just gimme some - space. Central Park may be the lungs of the city, but when summer rolls around, festivals, gigs, games and screenings transform green spaces all over the five boroughs into its kitchen, classroom and concert venue, too. From indulgent food festivals to catching the New York Philharmonic perform for free, here are some ways you can get more from your New York park than benches and ice cream. In the shadow of Brooklyn Bridge, this park becomes a go-to spot for dance parties, picnics and sports when the days get longer and memories of the harsh New York winter recede. However, what makes it truly special is its annual season of free movie screenings during July and August. The backdrop cannot be beaten, the skyscrapers of the Financial District towering over the water and that most famous of bridges stretching out across the East River. Previous screenings have included everything from Cat on a Hot Tin Roof to Beetlejuice. Check brooklynbridgepark.org for film times and make sure you get down early, as things can get seriously crowded. A Brooklyn park isn’t the first place you’d think to come for a lesson in American independence. In the middle of Fort Greene Park, one of Brooklyn’s finest green spaces, stands the Prison Martyrs Monument. It was constructed in the early 20th century to commemorate the deaths of 11,500 men, women and children captured by the British when they overran the one-time fort in 1776. Book a tour via NYC Parks and Rec (nycgovparks.org) and you can scale the 143ft Doric column, learning about the martyrs’ plight. Stunning Manhattan skyline views are an added bonus. A relatively recent favorite of New York's foodie scene, Brooklyn's weekly Smorgasburg (smorgasburg.com) food market can now be found in locations across the borough. But its spiritual home is undoubtedly East River State Park in Williamsburg, where it pitches up every Saturday during summer. With the waters of the East River slapping against the boardwalk and spectacular views across to Midtown, this little park is always special. Throw in food trucks from some of NYC’s best restaurants and you’ve got possibly one of the world's perfect picnic spots. Grab a Moroccan meatball sandwich from Rock The Kasbah (thekasbah.rocks), leave room for a sugary doughnut from Dough (doughbrooklyn.com) and stave off that afternoon nap with an espresso from Brooklyn Roasting Company (brooklynroasting.com). Handily placed between the hip twin-towns of Williamsburg and Greenpoint, McCarran Park has become the ultimate outdoor spot for catching the very latest bands. The annual Northside Festival (northsidefestival.com), held in early June, always delivers and what’s more the shows in the park are free, as long as you arrange a ticket before the event. Standing in the park’s old baseball square, beer in hand and the sun glinting off the distant Empire State Building: there are few better places to catch a gig in NYC. The New York Philharmonic has been decamping from its Lincoln Center home to play free concerts in Central Park for 50 years. Held on the Great Lawn, with the city’s lights flickering on as dark descends, these concerts have become a summer staple in the Big Apple. Whether you’re a classical music aficionado or fancy seeing more of Central Park than the zoo and boating lake, pack a picnic, bring a blanket and prepare to lose yourself in the music. Fancy yourself as a modern day Bobby Fischer? Then make a beeline for Tompkins Square Park. This East Village spot, surrounded by classic New York walk-ups, has a series of built-in chess tables free for anyone to use. Take a seat and try to see off the challenge of the locals, who are as much a permanent fixture of the park as the tables are. Be sure to brush up on your moves before making your opening gambit, though. These guys know their stuff and it’ll be checkmate within minutes if you don’t keep your wits about you. 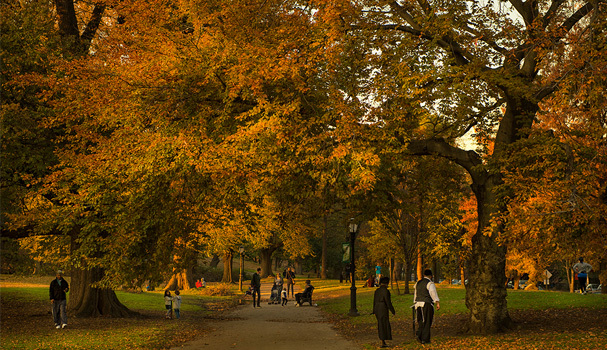 Prospect Park’s rolling paths and mature woodland are the ultimate way to escape the urban chaos for an afternoon. And it’s even better by bike. There’s a 3.35 mile cycle loop which is car-free at weekends, with motorists restricted to set hours during the week. The track skirts the outer edge of the park, trailing around the impressive lake, with a chance to cut across the famous Ravine, known also as the last forest in Brooklyn. Bikes can be hired privately or from the city-wide Citibike (citibikenyc.com) scheme. The latter costs $9.95 for a day of access to the bikes, plus an extra fee if you use the bike for longer than 30 minutes at once. (It's $9 for rides between 61 and 90 minutes). 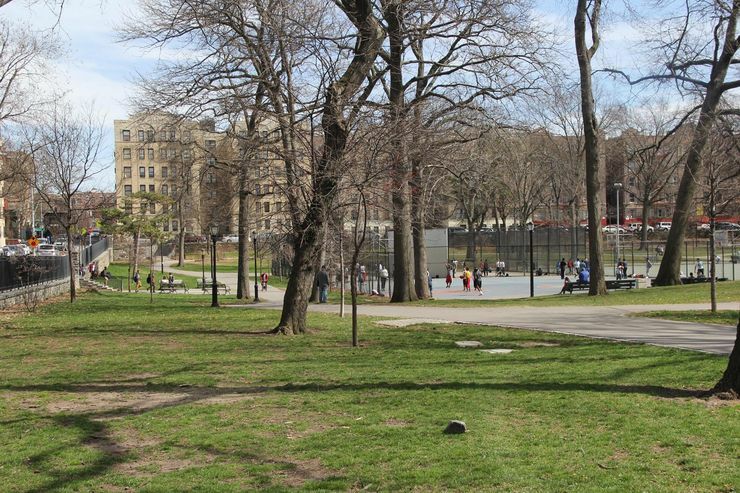 A small green space set next to the imposing sweep of the Bronx’s Grand Concourse, Poe Park is an essential stop-off for literature buffs. The small cottage nestled in its corner is where Edgar Allen Poe moved with his wife in 1846, hoping the country air would ease her tuberculosis. She died six months later. Poe wrote The Bells and Eureka here and his home has been restored to its original state. Visitors will find the place imbued with the gothic air for which Poe was renowned. The vast views down to the East River which Poe enjoyed have been lost to urban sprawl, but this slice of New York literary history makes this otherwise unprepossessing park well worth the long subway ride. The site of the 1964 World’s Fair, Flushing Meadows Corona Park in Queens remains famous for the Space Age-style towers, mosaic and unisphere which were built for the event. 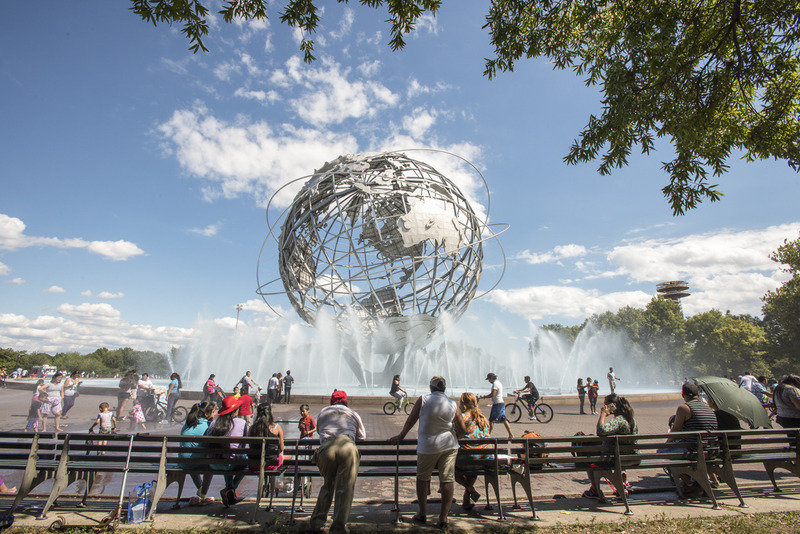 The unisphere globe is the most familiar, and its surrounding fountains offer excellent photo opportunities. However, it’s the towers and mosaic of the New York State Pavilion that are the most intriguing sights. Imbued with a sense of the 1960s Space Race, architect Philip Johnson’s buildings have been left to the ravages of time. However plans have been announced to partially restore the pavilion and paint the steel back to its original 'American cheese' yellow by autumn 2015. This once abandoned island in Upper New York Bay saw the opening of a new, 30-acre park in 2014. 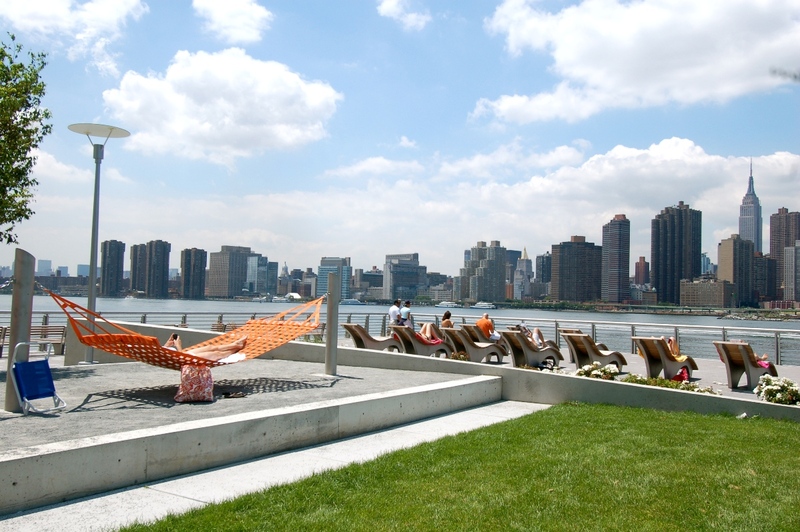 Open throughout the summer and accessible by free ferries from Manhattan and Brooklyn, New York’s latest green space features man made hills constructed from recycled spoil, with 360-degree views of the Statue of Liberty and Lower Manhattan. 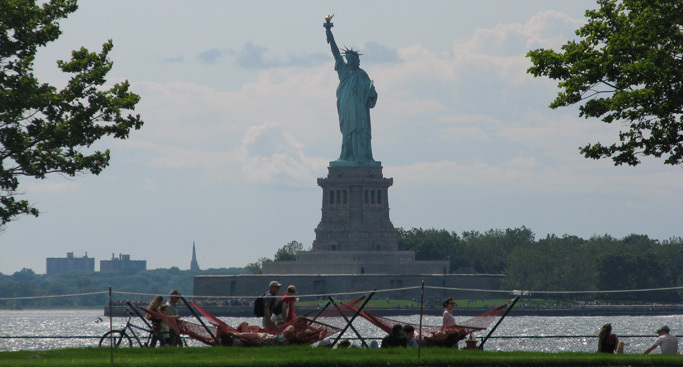 But the real draw for us is the hammock grove, with 50 hammocks for lolling around in. Best of all, there are plans to add a hill of slides, making Governors Island the ultimate playground for adults who’ve never grown up.